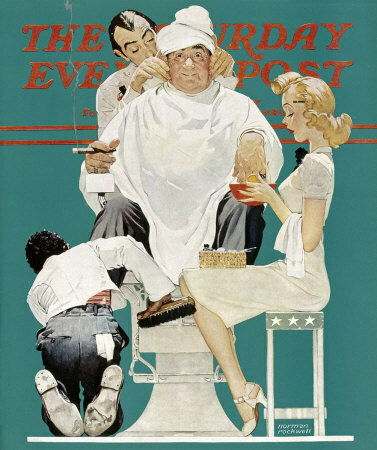 Full Treatment, a Norman Rockwell painting, appeared on the cover of The Saturday Evening Post published May 18, 1940. This is another favorite of Rockwell collectors, a classic enduring image of the world Rockwell painted. This painting was Rockwell's 194th overall out of 322 total paintings that were published on the cover of the Saturday Evening Post. Rockwell's career with the Post spanned 47 years, from his first cover illustration, Boy With Baby Carriage in 1916 to his last, Portrait of John F. Kennedy, in 1963. This was also the third cover for The Post in 1940. In 1940, there were seven Norman Rockwell Saturday Evening Post covers published. The original oil on canvas painting, 23 x 18 inches or 58.5 x 45.5 cm, is part of a private collection. on page 144 of Norman Rockwell, A Definitive Catalogue by Laurie Norton Moffatt. In this painting, Norman Rockwell gives us a glimpse into how to really take care of ourselves. This man, like the title of the painting states, is receiving every service available at this salon. He is receiving a manicure from the pretty young lady. He is receiving a shoe shine from the fellow squatting on his knees. Another man is has just completed his shave and is soon to start on his haircut/ harido. Full Treatment was only one of 322 Norman Rockwell Saturday Evening Post covers; Here is the list of Norman Rockwell Saturday Evening Post cover illustrations. He is enjoying all these services with a smile on his face, a cigar in his fingers and relaxation in that chair. All these things can be had today, for much more money. Just do not bring a cigar. That is no longer allowed. Do You Have A Great Story, Opinion Or Contribution About Full Treatment? Do you have a personal story about Full Treatment? Do you know the model personally? Do you have a different take on the commentary?